Chop Chop - 11 - Christchurch Roller Derby. Strong City. Stronger Skaters. Chop Chop - be a quick jammer, chopping through the pack! My no.11 represents a pair of chopsticks. Got through the pack on my first jam. 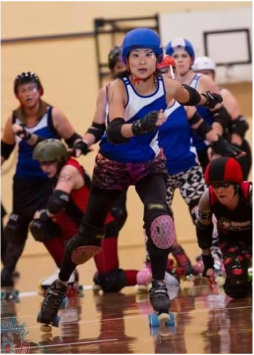 Every time when I stand on the jammer line, I feel it would be the biggest challenge. They are the most encouraging, friendly and fun people I've met. The best bunch ever! Just do it. You will love it! Attitude. Currently practicing it on my skates. 1 horse size duck. I might be able to fly on his back.